‘Magical Imaginations’ is a workshop series I have crafted for Chembur Naka Mumbai Public School. If you’ve read my about page, you would know how much I love creating, learning and sharing. I especially love it when I can do activities collaboratively with large diverse groups of people. I gives me a magical rush and opens up fresh perspectives. 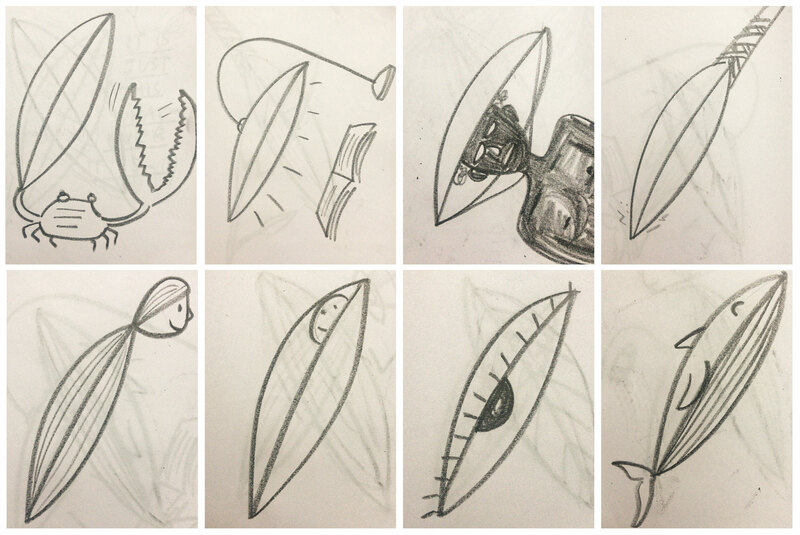 Although I had initially designed a physical workshop for school students, later I thought of taking a part of it online on Instagram as a quick exercise with a diverse audience. I made a basic shape on Instagram stories, posted it and asked people to take a screenshot of it and doodle whatever they see the shape as. For 48 hours we had a wild, wild party on Instagram. I had 100 + submissions of Magical Imaginations on my DMs. I’m adding a few gif compilations of the zillion imaginations below. The Instagram handle of each artist being mentioned below their respective frames. The pencil sketches above are my interpretations in my sketchbook. I generally do all my initial brainstorming with pencil on paper. My thought behind having this workshop in school was to let kids have fun while letting their imaginations go absolutely bonkers, and use this exercise as a metaphor while approaching life. Your mind is magical. Allow it to be a magician. When you face a problem, don’t get stuck in your first interpretation of that problem. Remember that your mind is magical and allow it to make it’s further magical interpretations. eg (w.r.t school students): Maybe you are feeling sad because you just lost a pen. Now don’t just sit with that. Allow your mind to look at the same situation in a different manner. Maybe the second time the same situation could be an opportunity to make a new friend and borrow a pen. If you further allow your mind to look from yet another perspective, maybe the same situation could look like an opportunity to try out a different pen or to enjoy writing with a pencil after a while. The possibilities that our mind can come up with are endless; our only job is to allow it to be what it is – a magician. Add any other situation that you are currently facing in place of the example given above and brainstorm on different ways to look at the same situation to experience abundance of magic in daily life. When anyone (including me) first sees the basic shape shown above, each of us sees one thing, not necessarily the same thing. When asked to search or imagine what else it could be, we all start thinking and start to experience the magic of seeing a zillion things in the same one thing! Isn’t it wonderful how our mind works? For a few days from doing this exercise, try looking at situations in multiple ways. Try looking at your friends, family and yourself in multiple ways. Everything you see and experience might be the same at first. But then ask yourself ‘What else/How else’ again and again and again and experience the magic in the same old things and beings. Let me know in the comments below about your experience. I am now parting with a few of the many parting notes shared with me by the participants of this activity. Previous Finding peace in the whimsical journey of discovery.